Chauncey Billups can still hit the BIG one. *All images by the Associated Press. He’s no longer the starting PG of a championship contender (okay, that contender part is arguable). He’s bounced around four teams in the past 6 years. He has the worst FG% of the Clipper starting unit. His 3.8 assists per game is his lowest since the 2000-2001 season. His 31 minutes per game is his lowest since his first year with Detroit. So many gloomy signs for Chauncey Billups. Could be his age? Could be his motivation? 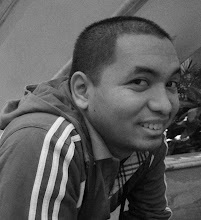 Who knows, really? But there are good things, too. 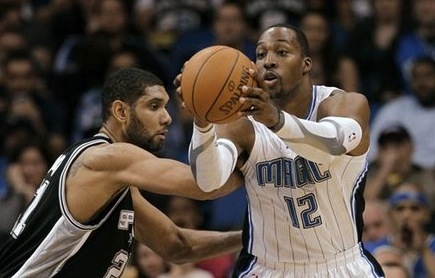 He’s averaging less than 2 turnovers per game for the first time since 2002-2003. His 2.4 threes made per outing is the most in his career, and tops for the Clips. He leads his new team in FT% and FTs made per game, and is third in scoring average. 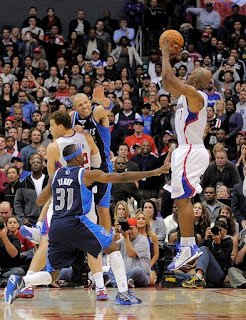 And, of course, he is still THE Mr. Big Shot. For all the craze that pushed Billups out of Detroit to Denver, out of Denver to New York, and now out of New York to the “other” Los Angeles team, it actually seems things are falling into place again. No doubt CP3 has had the most major impact on this season’s fortunes for the Clippers, but Billups at the two-guard spot, though relatively unorthodox, seems to have worked wonders, too. The Clippers are just half a game behind the Lakers in the Pacific, and they have beaten the Lakeshow three out of three times already. If they will, indeed, be this year’s breakout team, then Mr. Big Shot will have to continue living up to that name. DEN over PHI, 108-104 – Andre Miller pumps in an almost-tripple-double as the Nuggets deflated the Sixers’ winning run. WAS over OKC, 105-102 – Yes, this actually happened. John Wall was a beast with 25pts, 7rebs and 8asts. SAS over ORL, 85-83 – Spurs win a tight one in overtime thanks to Tony Parker’s 25pts, 7rebs and 9asts. NJN over GSW, 107-100 – Big win, upset win, for the Nets as the Warriors continue to miss Steph Curry. PHX over NYK, 91-88 – Ummm… D’Antoni and Stoudemire no more backsies okay? BOS over TOR, 96-73 – Big Green finally stop their slide, but it’s just the Raptors, so it might not really mean big things are a-happenin’. ATL over POR, 92-89 – Joe Johnson and the Hawks withstand a LaMarcus Aldridge double-double, and a fourth quarter Blazer run, to hold on to the win. MIN over DET, 93-85 – Kevin Love’s Wolves have won back-to-back and are looking in-sync. 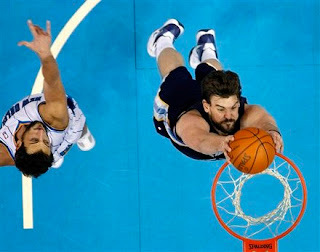 MEM over NOH, 93-87 – Marc Gasol carries the weight of Tennessee on his shoulders. SAC over IND, 92-88 – Pacers looked a little shaky as the Kings roared back to steal the win and give Indiana a bad forst taste of the Western Conference. LAC over DAL, 91-89 – B I G S H O T by Mr. Big Shot. Props to DeAndre Jordan, too, who had 19pts, 5blks and 9rebs. Tim Duncan is the past. Dwight Howard is the present. 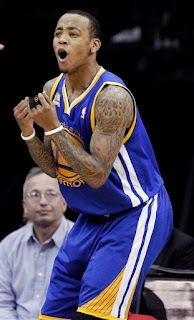 Monta Ellis celebrates, or is infuriated? Gasol slams one home against the Hornets.